“애국 운동으로 이어진 믿음의 실천자, 김세지"
한 여자로 태어나 누구의 딸로 불리고 시집을 가서는 누구의 아내로, 그리고 아들이 태어난 이후로는 아들의 엄마로 불리며 이름도 없이 그저 성만을 가진 조선의 여자들에게 이름을 가지게 된다는 것은 단순한 호칭을 얻는 것과는 비교할 수 없는 변화이었을 것이다. 세례로 이름을 얻은 그 날을 자기 해방의 날로 새기며 갇혀 있는 조선의 여성들을 깨우치는 교사로 복음을 알리는 전도부인으로, 그리고 독립을 위한 민족운동에 적극적으로 가담한 김세지는, 가부장적 사회구조 속에서 이름조차 없이 살던 여성들에게 자신의 이름을 얻는다는 것은 여성도 남성과 동등한 존재로 인정받는 것이요 독자적인 삶의 권리를 찾았음을 의미한다고 회고한다. 1865년 평안북도 영유읍에서 딸만 넷인 집 막내로 태어난 김세지는 12살에 아버지를 여의고 당시의 관습대로 16살에 시집을 가게 되지만 결혼한 지 두 해 만에 남편이 세상을 떠나며 암울한 시간을 보내게 된다. 4, 5년 이후 평양에 사는 김종겸과 재혼을 하며 전처 사이에 둔 두 자녀를 정성으로 양육하며 행복한 가정을 꾸리려 노력하지만 남편의 외도로 맘고생이 많았다. 1892년 홀(W. J. Hall) 선교사가 북쪽 지방 감리교회를 개척하기 위해 평양에 들어와 전도와 교육사업을 펼치며 얻은 첫 열매인 김세지의 8촌 시아주버니인 오석형의 “예수를 믿으면 집안이 평안할 것이요, 남자는 주색잡기를 버리고 살림에 힘써 내외간에 화순 하게 되리라” 라는 말에 김세지가 예수를 믿어보기로 한 것이 1893년이다. 선교사 홀의 순직 이후 평양에 들어와 남산현교회를 중심으로 북쪽 지방 감리교 개척에 힘을 쏟은 노블선교사의 부인을 만나게 되며, 김세지는 한글을 깨우치고 성경과 기독교 교리를 외우며 구원의 확신을 갖게 되었다. 세례를 받으며 얻게 된 세지란 이름은 서양식 세디란 이름을 한자로 음역한 것이다. 1898년부터 전도부인이 되어 평안도와 황해도에서 복음 전도활동을 벌이며 매년 2,000회가 넘게 가정을 방문했고 상당량의 기독교 서적을 판매하였는데, 기생, 무당 등 소외된 계층의 여성들이 그녀의 주요 전도대상이었다. 장례가 난 집을 찾아가 시체 염을 하는 일을 도맡아 하며 전도하는 일도 그녀의 몫이었다. 기독교 복음 안에서는 그녀에게 천한 일도, 두려운 일도 없었다. 1902년 남편이 세상을 떠났지만 삼 남매를 더욱 열심히 가르치면서 꿋꿋하게 삶을 일궈나가며 자신의 영혼을 하나님께 맡기고 더욱 주의 일에 매진하였다. 노블부인을 보좌하며 평양 남산현교회 사역과 순회전도에 힘쓰던 김세지는 1903년 보호여회를 조직하였다. 정동제일교회 보호여회가 조직된 지 3년이 지난 때였다. 회장을 맡아 보호여회를 이끌며 여성들의 능력개발과 조직적인 구제활동, 전도사업을 펼쳐나가는 한편 적은 회비를 모아 기도방을 만들고 아직 복음이 전해지지 않은 곳에 기도처를 세웠다. 젊어서 과부가 된 김세지는 같은 처지의 고생하는 과부들을 동정하는 애틋함이 컸다. 1916년 과부회를 조직하여 넉넉하게 사는 과부들이 성금을 모아서 가난한 과부들을 도와주고 또 그들에게 복음을 전하기 위해 노력했다. 1919년 11월 평양의 감리교와 장로교 여성들이 연합하여 대한애국부인회를 조직할 때 부재무부장을 맡으며, 성금을 모아 3.1 운동으로 투옥된 인사들의 가족들을 돕는 일과, 해외에서 활동하는 독립운동가들을 지원하였다. 1920년 10월 일본 경찰들에게 대한애국부인회의 조직이 발각되어 김세지도 체포되면서 고문과 악형을 이겨내야 했다. 민족운동으로 확장된 김세지의 지도력은 석방된 이후 3.1운동으로 와해된 보호여회를 재건하며 다시 한번 발휘되었고, 1923년에는 모금한 기금으로 교회를 개척하기도 했다. 1925년 60세가 되어 전도부인직을 사임하기까지 김세지는 26년을 전도부인으로 살았다. “나는 아는 것과 배운바 그리스도 예수의 구원의 도를 많은 남녀에게 전파케 하여 이로 인하여 주의 말씀을 듣고 믿기로 작정한 남녀의 수효가 수천에 이르게 하신 하나님께 감사할 뿐이다” 전도부인 김세지가 눈물로 닦은 자기희생의 길 위에 교회가 개척되고 보호여회가 세워졌으며 그 길은 독립을 염원하는 구국의 길로 이어졌다. 그리고 그 길 위에 오늘의 여선교회가 우뚝 서 있는 것이다. Being born as a girl meant getting called as a daughter, a wife, and a mother. Therefore, earning distinctive names other than just last names or titles for the females in Choseon was a big revolutionary change when considering the fact that most females were mere placeholders in society. “My first encounter with the Methodist Covenant was achieved not long after I first heard the sermon of the W.A. Noble missionary’s wife. As a result of studying the Bible with diligent efforts to read and write even during the busy house chores, I was baptized by Pastor Noble in the year his wife came to Pyongyang. That is how I got the name, Sadie. Although I was just an individual without a name, I came to find one of women’s rights through a baptism by the grace of the Lord. In this sense, it could be concluded that the liberation of Choson women originates from Christianity. As Kim Se-ji became “Sadie” on the day of her baptism, she recalled that period as the commencement of women’s liberation. Moreover, Kim Se-ji was also an active participant in the national movement for independence, a witness to the gospel, and a teacher for women locked in a patriarchal society. She mainly taught that earning a name meant that women are recognized as equal to men and that they have found their own right to life. In the year of 1865 in Young-eup, North Pyongan Province, Kim Se-ji was born as the youngest daughter among three older sisters. At the age of sixteen, she got married in order to follow tradition. However, after two years of her marriage, her husband passed away and not long after, she fell into depression. After four or five years, Pyongyang has remarried Kim Jong- Kyum and tried to build up a happy family by nurturing two children. However, she was greatly troubled due to her husband’s affair. In 1892, a missionary, W.J. Hall, arrived at Pyongyang to pioneer the Northern Methodist Church and the first fruit that he obtains from creating the education department are the wise words that were spoken by Kim Se-Ji’s third cousin, Mr. Seok-Hyung Oh. After he quoted, “If you believe in Jesus, your family will be at ease, and men will be able to abandon wine, women, and gambling but won’t abandon their household”, Kim Se-Ji decides to devote her time for Jesus in 1893. After W.J. Hall passed away, Kim Se-ji meets his noble missionary wife who pioneered the North Methodist Church, headquartered at the Namsan prefectural church. Due to her encounter with the Noble missionary wife, Kim Se-ji becomes proficient in Hangeul, memorizes the Bible and Christian doctrine, and becomes convinced of salvation. The name of Se-ji, which was obtained by baptism, is a transliteration of the Western-style named “Sadie” into Hanja. Since 1898, Kim Se-ji has been a Bible woman and has been conducting evangelistic activities in Pyongyang and Hwanghae provinces, it is concluded that she had visited more than 2000 households every year and had sold a considerable amount of Christian books especially towards her intended audiences; Shamans and Korean geisha. Moreover, her passion to spread Christianity did not end there. She even looked for a funeral to attend which would meant that she would have be shrouded and participate in cleaning the deceased. However, in the Christian gospel, none of her work was labeled as lowly, and menacing. Although her husband passed away in the year of 1902, she maintained to spread further education for her three children and entrusted her soul to God by doing more of his kingdom’s work. 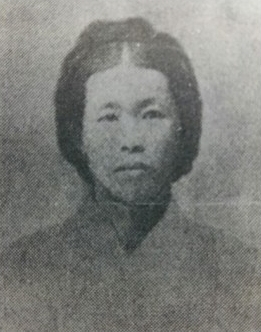 Kim Se-ji, who assisted Mrs. Noble and worked for the Church ministry of Namsan prefecture in Pyongyang and evangelism tour, organized the Protestants in 1903. It was three years after the Jeongdong First Church Protectorate was organized. In other word, Kim Se-ji was a woman with no previous experienced helped to lead the Protestants, her efforts at promoting women’s rights, relief work, and evangelism all at once. She also gathered a small amount of dues to build a prayer room and set up a prayer place where the gospel was not yet revealed. In November 1919, Methodist and Presbyterian women in Pyongyang united to serve as deputy finance ministers when organizing the Korean Patriotic Women’s Association. They also aided the families of those who were imprisoned in the 3.1 movement and supported independence activists who are working overseas. 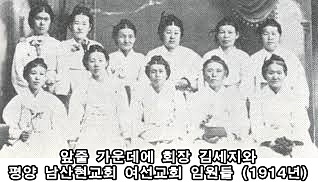 In October 1920, the organization of the Patriotic Women’s Association which was against Japanese police officers was discovered and Kim Se-ji was arrested and forced to overcome torture and severe punishment. Kim Se-ji’s leadership, which was extended to the national movement, was once again demonstrated by rebuilding the Protestant that had been broken up by the 3.1 movement and in 1923, she raised the church with donated funds. Before the age of sixty in 1925, Kim Se-ji lived as an BiBle woman for twenty-six years and resigned as a minister of evangelism. “I am grateful because with the knowledge that I have gained, I am able to identify God as the one who has caused the thousands of men and women to believe and hear the word of the Lord and the salvation of Christ Jesus.” The tears of Kim Se-ji were wiped off only when she was on the path of self-sacrifice. Not to mention that her path of self-sacrifice helped pioneer the church and an established protection camp. Most importantly, her sacrifice also shed a light on a national welfare for independence. For this reason, because of Kim Se-ji’s self-sacrifice, the missionary of women still stands.